This Thursday, 26 January 2018, the Bulletin of the Atomic Scientists stated they have moved the minute hand of the doomsday clock thirty seconds closer to midnight. 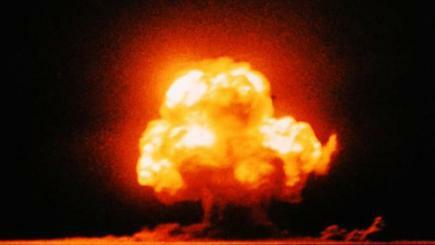 The Bulletin was created in 1945 by University of Chicago scientists who had worked on the creation of nuclear weapons. In an effort to point towards the danger to which humanity was exposed the clock was created as a sign. For the past 70 years the position of the minute hand has varied. It was set at 17 minutes to midnight following the signing of the Strategic Arms Reduction Treaty in 1991, which was seen as a very hopeful event. Other events, such as the testing of nuclear weapons by North Korea have seen the hand move closer to midnight. The clock has never been closer than two minutes to midnight. The clock was first set to two minutes following the initial testing of Thermonuclear Weapons by the United States and the Soviet Union in 1953. Until the present the clock has not been so close to doom since the height of the Cold War. ... there has also been a breakdown in the international order that has been dangerously exacerbated by recent US actions. In 2017, the United States backed away from its long-standing leadership role in the world, reducing its commitment to seek common ground and undermining the overall effort toward solving pressing global governance challenges. Neither allies nor adversaries have been able to reliably predict US actions—or understand when US pronouncements are real, and when they are mere rhetoric. International diplomacy has been reduced to name-calling, giving it a surreal sense of unreality that makes the world security situation ever more threatening. Lest we forget, the United States possesses at least one thousand four hundred thermonuclear weapons which are less than an hour away from any target which might be chosen. Russia holds similar numbers of weapons, while Britain, China, France, India, Israel, North Korea, and Pakistan also hold deliverable weapons. ^ That is too good. On the plus side we might hear some Iron Maiden of the radio. Nukes theoretically keep humans from simply killing each other for lulz, resources, venge or removing competition hence they are good. However fundies and other lunatics should not be allowed to have nukes. That's dangerous. When are we going to auction Sub-Saharan Africa? "Hyperbolic rhetoric" found the partisan hack. Listen here soyboy, war with the DPRK now would be preferable to thermonuclear war with the DPRK in 10 years. Not saying the DPRK is necessarily bad, but if the US wants to win a war easily and put their Goldman Sachs and Meryl Lynch buildings in Pyongyang, they should strike right away. Any attack now would result in a much smaller number of ICBMs and nuclear weapons fired at the uS in retaliation from NK than in the future. Which would result in a smaller loss of life for the US civilians, while the US would already have enough to obliterate most North Koreans. In the future, NK would get more nukes, while the damage America could inflict would remain the same. So from that stand-point, it would be better for the US to attack now. However, other events seem to show that with NK peace may be an option. Remember the recent talks between North and South Korea on unifying their sports teams for the Winter Olympics? Such efforts could continue to make everything even better over all. Kim Jong Un is going to be wanting to push for unity if he wants to give his people a chance to survive. Therefore, it would be best if America were to leave them alone to view the direction North Korea takes over the next few months towards increasing threats or peace and act from there.